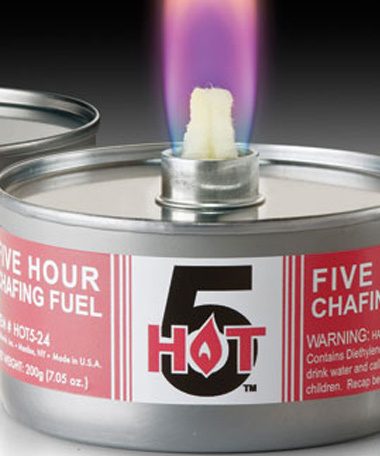 Hollowick HOT 5™ is a value priced 5 hour wick fuel from Hollowick specifically designed for super easy use. Cool: Fuel can stays cool when lit. Safer to handle than gel fuel. Cans may be placed directly on tabletops. Sealed: The fuel in the can is safely sealed. Only the wick burns, therefore the can is safer to handle. 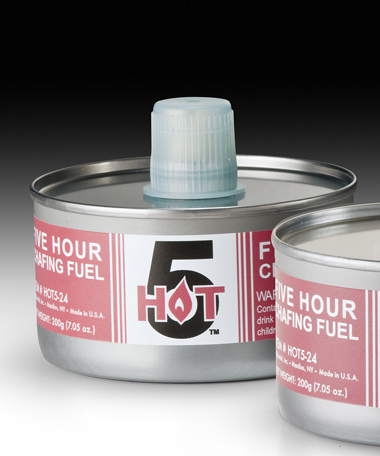 Efficient: One can of Hot 5™ will provide 2.5 times more burn time than a traditional 2-hour gel fuel. Reusable: Hot 5™ may be recapped after use and used again, reducing waste. Odorless: With odorless burning you will smell the food, not the fuel. Economical: Less expensive to use than gel fuel when comparing cost per burn time.